Sometimes on a page by itself, sometimes within, and interrupting, a more-or-less "normal" looking MetaFilter page. lofi is looking fine though, in mozilla. I think it's safe to say it happens everywhere, I just mentioned opera and lynx to show it's not browser dependent (which would be weird anyway because at the point where the error happens all the server's got is a USER_AGENT string, which output doesn't depend on anyway. Not to mention that if this kind of thing _was_ browser dependent we'd have to clobber matt to death with ponies and vibrating pancakes). kev23f: lofi's erroring for me too, from time to time. It just happens less because there's less page to output, and thus less space for it to go wrong. coldfusion.runtime.UndefinedVariableException: Variable USER_AGENT is undefined. Hey look, there's a camel walking across the horizon. I wonder if it's a sign. I'm also getting a blank mefi front page with no text aside from the recent comments box, which extends almost all the way to the left. IE 6. I've seen the blank MetaFilter front page with the extended recent comments box, too - it happens when the Server Error" text I quoted above appears inside the recent comments box. it happens on a.wholelottanothing.org as well, but not megnut. looks like it may be cold fusion related. perhaps the high ascii fixes from yesterday need to be backed out? Looks like Matt's playing with code to do some funky sorts or other things. I bet it'll stabilize in a little while, and then be faster, shinier, and now with a new, improved taste! FVW! Look... the camel has a pancake on his head! damn you pardonyou?.. So tempting to take credit, but alas :-(. Nice one. 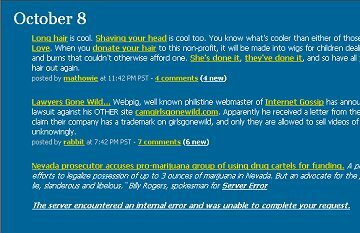 best part was clicking the 'server error link' took me to a marijuana site. coolest. server error. ever. Seems to be all fixed now, and running much faster than compared to the last few days. Did'ja have to do some tinkering, Matt, or was it just a matter of cleaning out some squirrel nests in the machinery? things should be better now. I was playing with how CF stores client variables, and after trying three different ways, have returned to the original way it was done, but have streamlined the storage so the server should hopefully stay fast. i think it's interesting that metafilter and fark are often glitchy at the same time. and if you draw glasses on this photo of metafilter ... HEY! I've noticed that "ColdFusion" is only two letters away, and sounds almost the same as, "confusion".